The ancient ecosystem was detailed Wednesday in the journal Nature. 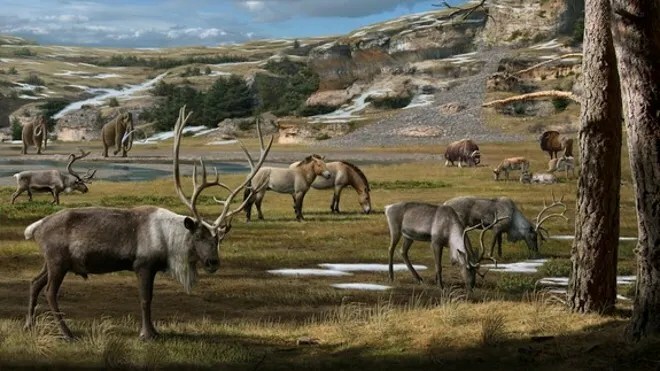 They also analyzed the DNA found in the gut contents and fossilized poop, or coprolites, of eight Pleistocene beasts woolly mammoths, rhinos, bison and horses found in museums throughout the world. The DNA analysis showed that the Arctic at the time had a varied landscape filled with wildflowers, grasses and other vegetation. And the shaggy ice age beasts that roamed the landscape took advantage of that cornucopia. The grazers supplemented their grassy diet with a hefty helping of wildflowerlike plants known as forbs, the stomach content analysis found. These forbs are high in protein and other nutrients, which may have helped the grazers put on weight and reproduce in the otherwise sparse Arctic environment, Craine told Live Science. Vanishing wildflowers Between 10,000 and 15,000 years ago, forbs declined in the Arctic,study co-author Mary E. Edwards, a physical geographer at the University of Southampton in England, wrote in an email. Though it’s not exactly clear why, “we do know from much other evidence that the climate changed at this time,” Edwards said. The ice age was ending and warmer, wetter weather was prevailing. That climate “allowed trees and shrubs to flourish and these would have outgrown forbs by shading them for example,” Edwards said. It’s also possible that the vanishing of these high-protein plants hastened the extinction of ice age beasts such as the woolly mammoth . For example, grasslands may have been delicately balanced, with poop from the grazers nourishing the plants, which in turn kept the animals alive. If a big jolt in climate disrupted one part of the chain for instance by depleting the forbs that may have led the whole system to collapse, Edwards speculated. The findings also raise questions about modern grazers such as bison, Craine said. If the ancient beasts dined on forbs, it’s possible these wildflower-like plants play a bigger role in the diet of modern bison as well, he said.